We have recently been clearing out my mother-in-law’s house and amongst the pots and pans and furniture we came across lots of photos. 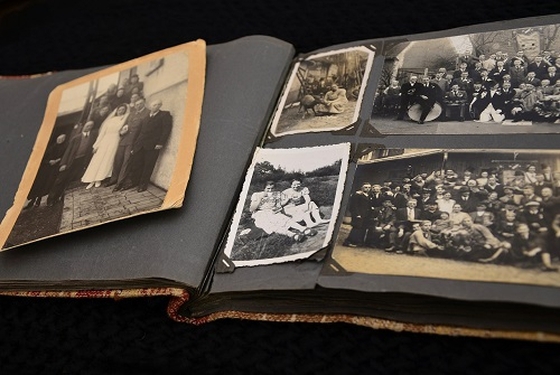 We sat down to look through the albums – and it took me right back to my childhood when a photo was a precious memory of an event, like a visit to a relative, or a wedding or a christening. How things have changed – nowadays everyone is taking photos of everything. You don’t buy a phone unless it can take decent quality pictures. And if you have teenagers around, they are forever taking selfies and sending them on to friends and friends of friends. But they have become disposable. Snapchat and Instagram record just the moment, there is no story attached to them. When we look through an album, then memories are refreshed and stories retold of that holiday and of who fell into the swimming pool. So story is as important as the photo. How the photo speaks to us is shaped by the stories we have around it. If the photo is of someone who has died, then there are life stories to be told and remembered. Places, people and context become linked into that photo. Jesus liked to tell stories, and they were so memorable that people told them to each other and then they were written down and put in order – and so we have the Gospels. But we can’t divorce the story from the context, be it economic, political or social. The eternal truths in the stories of Jesus are shaped by the context, but transcend time and space and are just as applicable to living today as they were 2000 years ago in Palestine under Roman occupation. So, as we revisit familiar stories of Jesus, let them be like old photos, reminding us of a time gone by, yet carrying the Word of God into our hearts and lives, right now and right here!